The pancreas is an abdominal organ located deep in the retroperitoneum. It is a gland with mixed function: both exocrine and endocrine. In this article, we will consider just the exocrine functions of the pancreas, the synthesis of pancreatic enzymes and the regulation of enzyme secretion. Finally, we will consider the clinical relevance of the pancreatic exocrine functions. When we consider the functions of the pancreas, it is simpler to view it as a mix of two glands. We can divide the pancreas into an exocrine gland, containing the acinar and duct tissue, and the endocrine gland containing the islets of Langerhans. 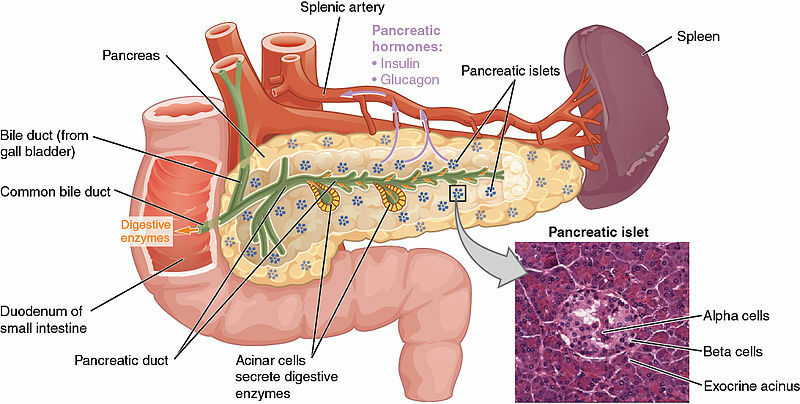 The majority of the pancreas is made up of the exocrine portion (85% by mass) and secretes digestive enzymes, water and bicarbonate to assist in digestion. The bicarbonate helps in neutralising the stomach acid. This is a vital part of digestion as the small intestine is not specialised to withstand the strong acids from the stomach. This is because the small intestine, unlike the stomach, lacks a thick protective mucous layer. Additionally, the digestive enzymes secreted by the pancreas reach their optimum function at a basic pH. This is achieved by the bicarbonate secretions of the pancreas. The functional unit of the exocrine pancreas includes the acinus and its duct system. The word acinus is from the Latin term for “berry in a cluster”. These acinar cells are specialised in enzyme synthesis, storage and secretion. The duct system modifies the aqueous secretions. This mechanism is stimulated by the parasympathetic system and inhibited by the sympathetic system. Fig 1 – The functional unit of the exocrine pancreas includes the acinus and its duct system. The acinar cells produce digestive enzymes on the rough endoplasmic reticulum. They are then moved to the Golgi complex where they form condensing vacuoles. These condensing vacuoles are then concentrated into inactive zymogen granules in pancreatic acinar cells and stored for secretion. They are secreted into the main pancreatic duct, which merges with the bile duct at the head of the pancreas and forms the Ampulla of Vater. From here it enters the duodenum. Other enzymes include ribonuclease, gelatinase, elastase etc. Water and carbon dioxide combine in a reaction catalysed by the enzyme carbonic anhydrase. The product formed is carbonic acid (H2CO3). 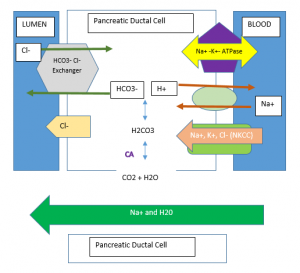 H+ ions are transported out of the pancreatic ductal cells into the blood in exchange for Na+ ions by an H+/Na+ antiporter. The Na+ ions that enter the cell are then removed by the Na+/H+/ATPase. The HCO3– produced from the dissociation of carbonic acid is then transported into the intercalated ducts of the pancreas in exchange for Cl–. An intracellular build up of Cl– is avoided by a chloride channel which allows chloride ions to return to the lumen of the intercalated ducts. The bicarbonate ions, Na+ ions and water then move through the intercalated ducts and end up at the main pancreatic duct ready for secretion into the duodenum upon an appropriate stimulus. There are a number of factors involved in triggering the pancreas to release its secretions. Vagal innervation to the pancreas stimulates the secretion of enzymes. This stimulation occurs when we see, smell or taste food, or when the stomach wall is stretched. There are also other ways in which the body encourages pancreatic secretions. Besides the vagal stimulation, acidic chyme entering the duodenum stimulates S cells to release secretin. Secretin is a hormone that causes the pancreatic cells to secrete the alkaline parts of the pancreatic juices. The fatty acids and protein present in the chyme, combined with the acidic pH, trigger I cells in the duodenum to release the hormone cholecystokinin (CCK). This hormone also leads to secretion of digestive enzymes in the pancreatic juices. In addition, CCK stimulates bile secretion via gallbladder contraction. Anatomically, the main pancreatic duct merges with the bile duct, which leads to the Ampulla of Vater. It is here that these secretions pour into the duodenum and help neutralise and digest chyme. 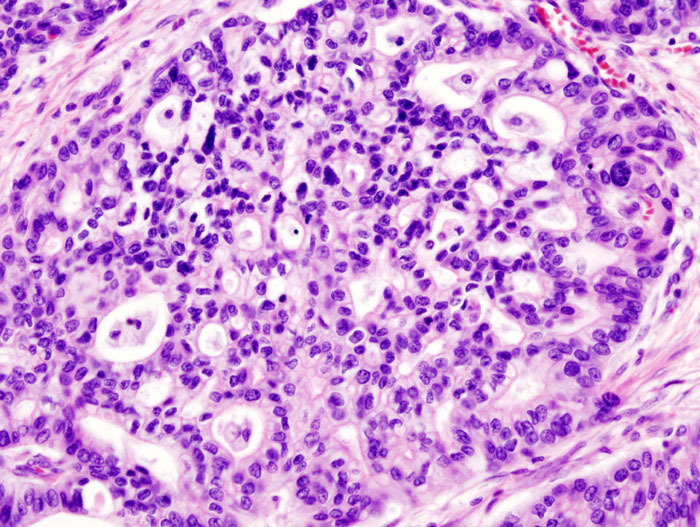 The most common cancer of the pancreas occurs in the exocrine portion and are called ductal adenocarcinomas. 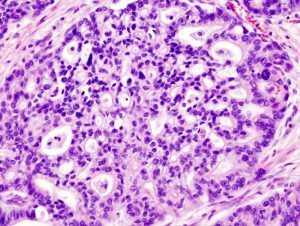 Ductal adenocarcinomas can disrupt exocrine secretions, causing patients to develop pancreatitis and pain. Digestive enzymes are secreted into the pancreas instead of the duodenum. As key digestive enzymes are not reaching the duodenum effectively, this can lead to diarrhoea and incomplete digestion of food. Pancreatic cancers are mostly diagnosed at a very late stage, as symptoms will only present once the cancer reaches a certain size. At this point it is often too late for surgery, which is the only curative treatment option available. This type of cancer is very difficult to treat and as such has a poor prognosis. An inflammation of the pancreas is known as pancreatitis. Pancreatitis can be diagnosed by detection of pancreatic amylase and lipase in a blood test. A common presentation would be intense pain in the central abdomen radiating to the back. Patients may complain of pale stools and dark urine. In pancreatitis, the digestive enzymes of the pancreas damage the tissue and structure of the pancreas. The digestive enzymes do not reach the duodenum, leading to incomplete digestion of fatty acids. This results in fatty stools (steatorrhoea), which have a pungent smell and float in water. Bicarbonate secretion in ductal cells depends on the protein CFTR. This is both a chloride channel and a bicarbonate channel. When the CFTR protein is defective, as it is in Cystic Fibrosis, the secretion of bicarbonate by duct cells is affected. This leads to a blockage in the pancreatic ducts and inappropriate zymogen activation. This causes damage to acinar and duct cells. Patients suffering from a complete lack of CFTR function are usually born with pancreatic insufficiency. This means their pancreas releases an inadequate amount of digestive enzymes. These patients require constant treatment with digestive enzyme supplements. To a lesser degree, patients with less severe mutations in CFTR proteins with some limited channel function still have an increased risk of developing pancreatitis. Which hormone leads to the secretion of digestive enzymes from the pancreas? What blood test is the best indicator of pancreatitis?